"Celebrate Edith Piaf," Bloomsbury Publishing, New York. Carolyn takes part in a Google+Hangout discussion on the 50th anniversary of her death. 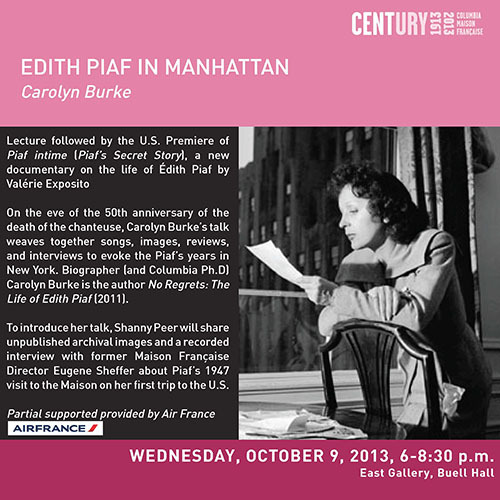 "Édith Piaf in Manhattan" lecture by Carolyn Burke followed by the U.S. Premiere of Piaf intime (Piaf's Secret Story), a new documentary on the life of Édith Piaf by Valérie Exposito, including her visits to New York City (screened in French with English subtitles)."